There are certain words that are atypical to use together for they are to many, an oxymoron. I’m about to use one that will make certain segments of our population cringe in disbelief that two ostensibly disparate words would be used in the same sentence. Since you’ve been warned, I’m going to say it: President George W. Bush is a classy ex-president. Concomitant with the release of his memoirs, “Decision Points,” the former president appeared on Oprah Winfry’s show. When asked what he thought about the job his successor is doing, he replied, “I do believe you ought to treat people the way you want to be treated yourself, and so you’re not going to see me out there chirping away. I want our president to succeed.” He elaborated, “I don’t think it’s good for a former President to be out there opining on every darned issue. He’s got a plenty tough job. Trust me. And there’s gonna be plenty of critics, and he doesn’t need me criticizing him. And I don’t think it’s good for the presidency. Other people have a different point of view.” That is a courtesy that neither he nor President Reagan enjoyed, as they were preceded in office by men who didn’t have the class or the values that would allow them to be uncritical of their successors. 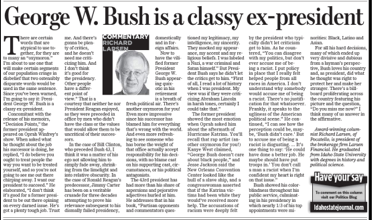 In the case of Bill Clinton, who preceded Bush 43, I think it was a matter of his ego not allowing him to simply fade away, shrinking from the limelight and into relative obscurity. In the case of Ronald Reagan’s predecessor, Jimmy Carter has been on a veritable crusade for three decades attempting to prove his relevance subsequent to his dismally failed presidency, domestically and in foreign affairs. Now to have the vilified former President George W. Bush appearing quixotic in his retirement is a breath of fresh political air. There’s another oxymoron for you! Even more impressive since his successor has blamed him for everything that’s wrong with the world. And even more refreshing to see someone who has borne the weight of that office actually accept responsibility for his decisions, with no blame cast on his supporting cast, circumstances, or his political antagonists. Bush showed his colorblindness throughout his public service, culminating in his presidency where nearly 1/3 of his top appointments were minorities: Black, Latino, and Asian. For all his hard decisions, many of which ended up very divisive and dubious from a layman’s perspective, Bush loves his country and, as president, did what he thought was right to protect her and make her stronger. There’s a billboard proliferating across the country featuring his picture and the question, “Do you miss me now?” I think many of us answer in the affirmative.